A brilliant young environmental journalist argues that we must innovate and adapt to save planet Earth in this enlightening “trip around the world to meet people working out new ways for humanity to live as well as survive” (The New York Times Book Review). With the historical perspective of The Song of the Dodo and the urgency of Al Gore’s An Inconvenient Truth, The Unnatural World chronicles a disparate band of unlikely heroes: an effervescent mad scientist who would fertilize the seas; a pigeon obsessive bent on bringing back the extinct; a low-level government functionary in China doing his best to clean up his city, and more. These scientists, billionaires, and ordinary people are all working toward saving the best home humanity is ever likely to have. What is the threat? It is us. In a time when a species dies out every ten minutes, when summers are getting hotter, winters colder, and oceans higher, some people still deny mankind’s effect on the Earth. But all of our impacts on the planet have ushered in what qualifies as a new geologic epoch, thanks to global warming, mass extinction, and such technologies as nuclear weapons or plastics. “A futurist ray of hope amid the usual denial and despair” (Esquire), The Unnatural World examines the world we have created and analyzes the glimmers of light emerging from the efforts of incredible individuals seeking to change our future. Instead of a world without us, this history of the future shows how to become good gardeners, helping people thrive along with an abundance of plants, animals, all the exuberant profusion of life on Earth—a better world with us. 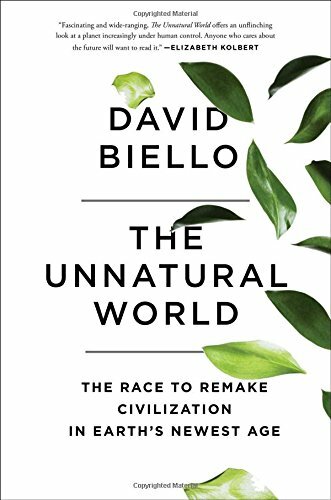 The current era of humans need not be the end of the world—and “Biello describes both what we have done to alter our planet and what we should do in the future to ensure its habitability” (Scientific American).